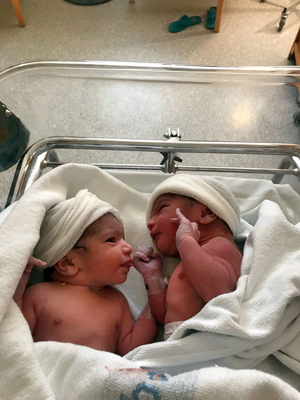 It is with great pleasure that Rais Akhtar announces the birth of his grandchildren, a boy and a girl, born to his daughter, Wasiqa, on April 11, 2018. Rais writes, "Alhamdolillah, mother and babies are fine, and are in Sweden. Prayers and best wishes are expected from every corner." Rais Akhtar, badge number 71863, worked for Aramco from July 1973 until the last day of 1985. He left Dhahran Airport and landed in Karachi, Pakistan on January 1, 1986. During these twelve and a half years, he worked for the Offshore Drilling Department, Ras Tanura West Pier. During his last year, he moved to Tanajib along with the Offshore Department. His last position held was as the Supervising Drilling and Fishing Tool Repairman. Rais and his family currently live in Karachi, Pakistan.